Tim Hovdestad, Marilyn Klinger, Samantha Campbell and Trina Brace at the community garden. 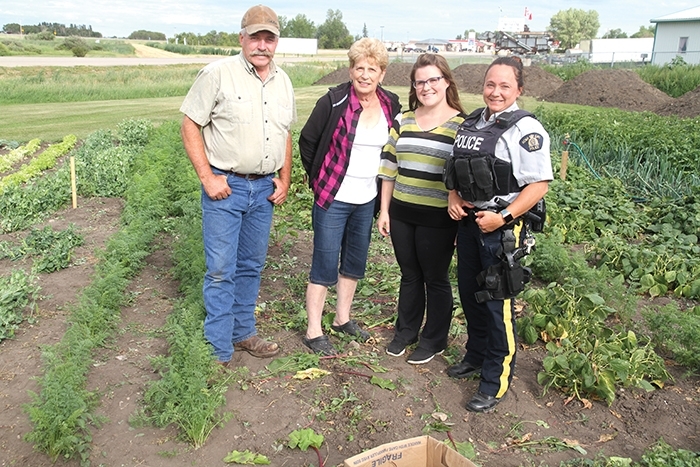 Clients of the Moosomin Food Share are receiving fresh vegetables in their food hampers this summer, thanks to the efforts of Food Share volunteers who are growing a garden to help those who need the Food Share’s services. The space for the garden has been donated by Sharpe’s Crop Services, as has fertilizer and a water tank to keep the garden watered. Flaman Group of Companies donated the use of a rototiller to work up the garden in the spring. Organizers are hoping someone will come forward with some well-rotted manure to add to the garden in the fall. Volunteers have been doing all the work in the garden. Volunteer Marilyn Klinger grows zucchini and spaghetti squash in her home garden for the food share. People also donate produce from their own gardens, from lettuce to zucchini to rhubarb. Volunteers were out picking beets and other vegetables in the food share garden Tuesday to include in the July food hampers. The food share board is hoping that clients will help out with the garden as well. Tim Hovdestad, one of the volunteers, says there is a simple reason why he volunteers his time growing vegetables for the less fortunate. “I like gardening, and I like food, and I thought this is something I can do to help. I think it’s great if we can grow food right here to help people. The Food Share received a small grant to help get the community garden under way. ”We were wanting to explore different options with the Food Share, and we came across this grant where we could apply for a little bit of funding,” says Trina Brace. “We applied, and we didn’t get the full amount, but it really helped us,” adds Marilyn Klinger. About 40 families receive hampers each month, and there are seven or eight emergency hampers between the monthly distributions.